Like elements in a giant Erector Set, the four steel girders (each weighing 155 tonnes) and trolleys are now ready to be assembled into a double overhead crane capable of lifting the heaviest ITER components. Last week, a 10-axle, 80-wheel self-propelled vehicle transported the large and heavy elements from their temporary storage into the Assembly Hall. Girders and trolleys will be lifted into position by a huge crawler crane operating from outside the 60-metre-tall building, which will pass its hook through an opening in the roof. The first elements of the crawler crane, one of the tallest in the world, were delivered to the ITER site on Monday 6 June; it will take more than 50 trucks to deliver them all and 10 days to finalize their assembly. Click here for more photos of activity inside the Assembly Hall. 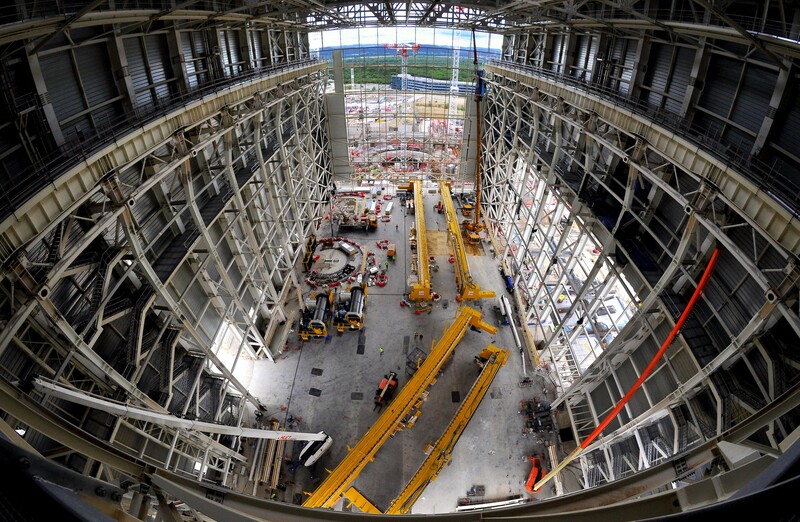 Click here for all ITER photos.